Undun Wind is the sire of World & Res. World Champions in buckskin and Foundation QH. 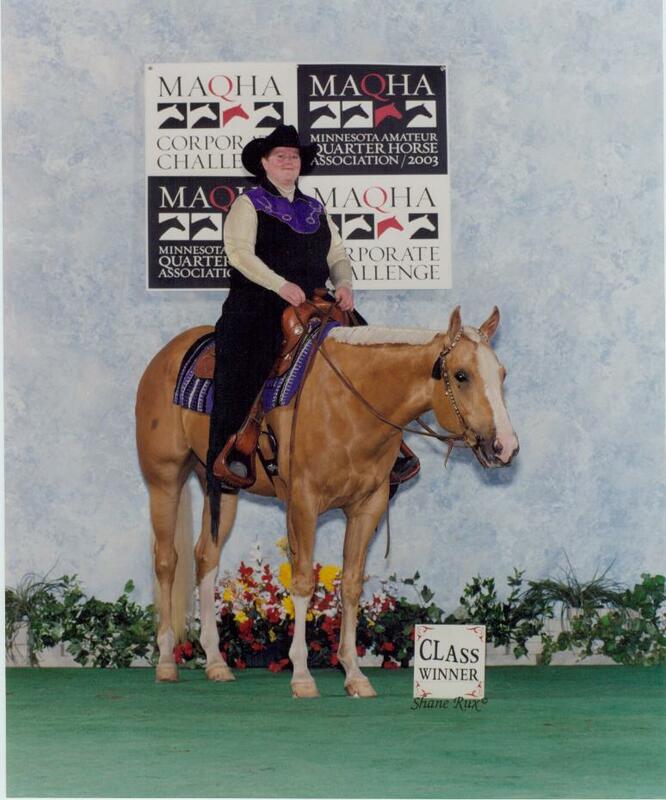 He is also the sire of the IBHA Jr. Western Pleasure Honor Roll horse; the IBHA Honor Roll Amateur Western Pleasure horse; the two time IBHA All Around Amateur horse; IBHA Supreme Champions; IBH Congress Super Horse; National All Around Performance horse; as well as many State and National High Pt Horses in WQHA, IBHA, and Foundation QH associations as well as many other state associations in other disciplines. His get have earned numerous Superior Event titles, and again he has get leading the nation for Honor Roll titles from Halter to All Around. And they just keep on winning! Check Out the Best Known Producer of All Around Horses in The Buckskin Industry Today! We had undun skip acall (Callie) and I talked to you guys about her. She tore a mussle in her back and I could not get her past it. She is now living by the kettle trails and has a great home with people who really love her! But she was the best girl ever and I loved her very much. Looking for that awsome ground manners and personality! Hopefully looking to get a horse in the next month or so and would love another baby from undun wind. Update: Kim purchased Reba's Undun Finale, an Appaloosa son of Undun Wind who is one of the family now. Congrats Kim!! Just wanted to give you a small update on your baby. He is absolutely fabulous! She started him under saddle on Monday. He never bucked, never even thought about it. She said she should be up on his back early next week. He is doing great in halter/showmanship. That boy learns fast and retains everything. He is everything I hoped he would be. He is so much like Gilbert...it's scary. People in my barn do not see the similarities between them, I think because of the color issue --- one being red, the other grulla. But if you KNOW them, you can see so much similarities. They have the same mannerisms, the same movement, the same temperments. I love it! You guys are just so wonderful for giving me the opportunity to own him. He is exactly what I wanted. I wanted to write and let you know how Gilbert is doing. He settled in great, never batted an eyelash. You were right about one thing....he LOVES his food! He did good in the trailer on the way home. Stood still and never got sweaty. I started him already on longeline, walking and we trotted a circle or two today. 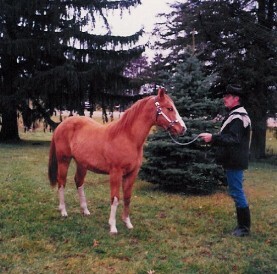 I started him on halter a little, too. So far he is excellent and I am very pleased. He never spooks at anything and he has yet to get excited about anything. He is so gentle....so kind. So THANK YOU, THANK YOU for giving me an opportunity to own such a sweetheart. That is truely what he is, a sweetie. I have received many compliments about him from barn members already. Everyone thinks he is a doll. You have produced, through your good breeding sense and dedication to these fine animals, some of the finest horses on the planet. Think of my Brett, valiant and beautiful, all heart and all soul. And Annie out there cutting it up, sure to be another Undun Wind WBHA queen's mount in the future. You have a gift, for horses and for people. You gotta stay in the business; you elevate it. Thank you!! Thank you!! Our kids didn't do too badly this year ~ but we all know whatever we accomplished ~ we would have never gotten there without your help & friendship. Thanks again!! Next Year?? Dan & Mary Crain and the "Kids"
I truly believe that Undun Wind is the horse that anyone should be looking for in a breeding stallion. If it weren't for the fact that my mare is one of his own babies, I would never look for another stallion to breed her to. 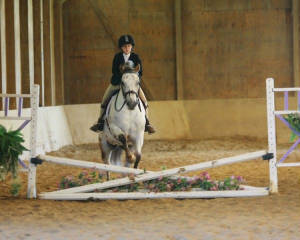 My Undun Wind gelding is a dream come true horse and is doing very well in the show pen. Cool has the prettiest jog and lope and is so flat in the knee that he hardly bends his legs at the lope - we have had several judges say that they can't wait to see him under saddle. Note: Cool has gone on to be an IBHA Supreme Champion with Superior Awards too numerous to remember, annual Year End National High Pts. and much more. Now being shown by a very young girl and we expect to see many more awards for Sky and Cool in the years to come! "This letter serves as our unqualified endorsement of the equestrian capabilities, knowledge and business practices of Sandy Meadows Farm. We have found them responsive to our every need and concern." "The horse industry is a hard industry to stay honest and successful in. However, Bob & Marlene Dreifke have focused on being honest and up front with buyers while still keeping their prominent place in the horse industry." I have had horses in my life since I was seven years old. Wind. His offspring carry a kind of equine "magic"
she just isn't like other horses. She seems to glow". I purchased two horses through email and video, sight unseen. The Dreifke's delivered them personally on time and in great condition. They were even more than we had hoped they would be. I would not hesitate to do business with these people again. They breed great horses and are very honest."